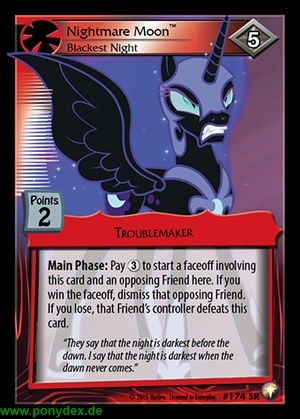 Main Phase: Pay 3 action tokens to start a faceoff involving this card and an opposing Friend here. If you win the faceoff, dismiss that opposing Friend. If you lose, that Friend's controller defeats this card. "They say that the night is darkest before the dawn. I say that the night is darkest when the dawn never comes."